Walking up Woodmont Avenue and turning onto Elm Street, I pass by the familiar restaurants and movie theatre. This time, on an early Sunday morning, the atmosphere and environment has completely changed. The street typically used for quiet, casual walks is now bustling with people circling multi-colored tents and marveling at various delicacies, meats, herbs and even copper wares being sold. On Elm Street, between Woodmont and Wisconsin Avenue, the Bethesda Central Farm Market is stationed, offering an array of unique and interesting products. 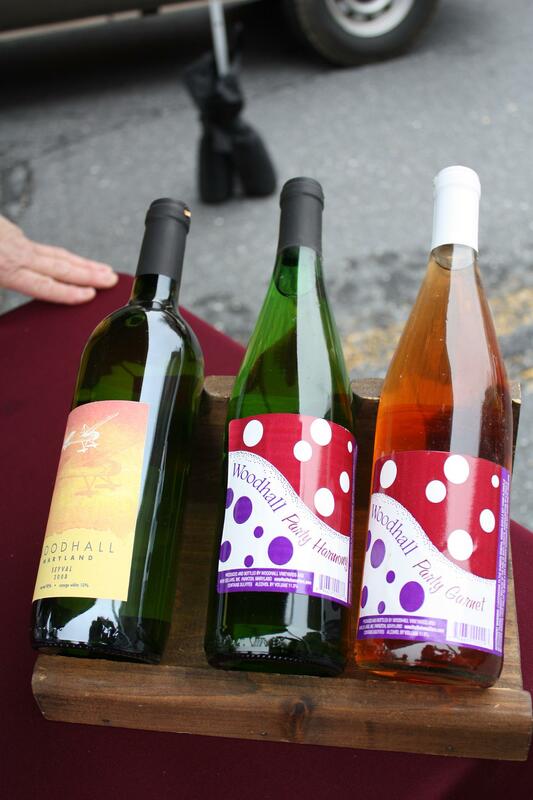 For example, among the archetypal wines it sells, Woodhall Wine Cellars offers a “Party Garnet” flavor, a blend of “candied fruit” with a subtle scent of “bubblegum, cotton candy, and strawberry.” It also produces a “Party Harmony” blend, composed of different tropical fruit flavors with a “touch of honey.” Though these festive wines receive some attention, purchasers play it safe with popular dry red wines like the Chambourcin and Cabernet Sauvignon. Near the wine station, veal and goat meat products draw much buyer attention. The proprietor explains that her farm is not a cruel slaughterhouse. Animals are not injected with hormones and stuffed in small cages; instead they are given normal healthy food to consume and plenty of room to roam free. Though the food and products displayed may seem like an integral part of the market experience, what makes the farm market truly special is the diverse people it attracts. Rather than solo shoppers going on their routine errands to buy some fresh and organic produce, the street is filled with couples, families, and dog walkers, who enliven an otherwise mundane custom. With these people’s energy and enthusiasm to discover, analyze, or merely peruse new and exciting products, the Bethesda Central Farm Market gives selling what some may call “ordinary” food a completely new meaning. Esther Schmunis is a graduating senior at the Melvin J. Berman Hebrew Academy in Rockville. After attending Midreshet Amit in Israel for a year, she plans to go to Syms Business School at Stern College in New York. In response to the great need for job creation, Bethesda Green is planning its second annual “Fields of Green” Internship Fair, Saturday, May 7, 10 am – 2 pm, at Bethesda Green, 4825 Cordell Avenue, Suite 200, located on the second floor above the Capital One Bank branch at the corner of Woodmont and Cordell Avenues. The goal of this event is to connect interested and talented young adults, ages 18-24, with local vocational and educational opportunities in our evolving green industry. More detail, including a listing of regularly updated opportunities can be found here. We expect to attract hundreds of students from local universities and colleges to visit over two-dozen tables showcasing local business, government, non-profits and academic institutions. Don’t forget this evening’s Bethesda Green First Thursday Happy Hour, 5 to 8 p.m. at Lebanese Taverna, 7141 Arlington Road, Bethesda, 20814. Learning about a number of volunteer opportunities Saturday April 9 — for example, It’s Time to Take Out the Trash and Clean Creek, Clean Potomac — to help watershed clean-up efforts throughout the area. And on April 17, the Cabin John Creek Cleanup. RSVP at the Bethesda Green Meetup page! 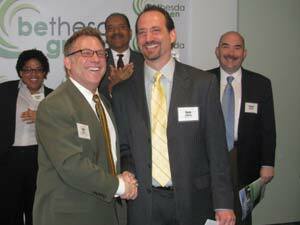 Cliff Chiet and Dave Feldman shake hands at the Maryland Gone Green event. Today’s Gazette of Politics and Business features a special “Maryland Gone Green!” insert section, highlighting 35 companies and organizations that have gone green, provide environmentally friendly services, or educate people about environmental sustainability. Representatives from most of those businesses showed up early—8 a.m.—at Bethesda Green, March 31, for an appreciation breakfast sponsored by the Gazette and Bethesda Green. Cliff Chiet, publisher of the Gazette of Politics and Business, thanked everyone for participating in the special publication. Chiet noted that all the legislators in Annapolis will get a copy, as will the 20,000 businesses that subscribe to the Gazette of Politics and Business. Firms featured in the publication include large international companies such as Marriott International, Inc., and Lockheed Martin, as well as local outfits such as All Eco Center, and Sustainable Design Group. The Bethesda Green Business Incubator also received a mention, with a sidebar about Aquabarrel. The Gazette has also gone green in one way, by using a color printing press that produces high-quality, color copies of the paper sooner in the printing process, thus reducing waste copies that cannot be distributed. Chiet said the press saves them 2,500 tons of paper per year. If you don’t subscribe to the Gazette of Politics and Business, you can read the “Maryland Gone Green!” section here.